A new study has looked at how six news sites’ Twitter followers engage and react to tweets. Twitter content publishing platform SocialFlow has assessed the Twitter audiences of Al-Jazeera English, BBC News, CNN, the Economist, Fox News and the New York Times. The study is based on bit.ly and Twitter data from more than 20 million tweets posted by the seven million users who follow these accounts on Twitter. Engagement can be read in clicks. The Economist has a highly active and engaged audience in terms of both clicks per tweet and retweets per tweet, suggesting a high level of alignment between content posted and attention users are willing to provide. Audiences differ in their willingness to consume and share information on Twitter. Al-Jazeera’s audience is the most active in terms of publishing and retweeting content on Twitter, while the Fox News audience generates substantially more clicks from its audience. A large number of followers doesn’t necessarily translate into action. Despite being the largest account, the New York Times garners the fewest clicks per tweet when audience size is normalised and earns many fewer retweets when compared to accounts that are much smaller. Timing and topical interest matter when seeking attention. By arranging audience tweets into topic maps, we were able to visualise the flow of attention between topics of interest, across the different audiences. It is worth being aware that this is what SocialFlow does: it offers solutions to businesses wanting to maximise the effectiveness of their tweets by timing them to get the most reaction. One of the points the study draws out is that where the Economist’s highly engaged Twitter audience clicks on links to the associated news article, Al Jazeera’s audience behaves differently. The study finds Al Jazeera English has the most retweets per tweet but followers are not necessarily clicking links – an all important goal for web publishers. The takeaway for publishers is one of topics, network and timing, as the report states. Knowing when an addressable audience is available and what topics they’d like to engage in is key to earning their attention. The study also points out that a Twitter audience is measurable and this should be analysed and used “to inform content development strategies and marketing planning”. While clicks bring immediate returns, retweets and other forms of audience participation raise trust and brand awareness, both imperatives for maintaining sustained growth. A high number of followers is not indicative of an engaged audience; a high click-through rate doesn’t necessarily yield other engagement metrics such as retweets and new followers. By paying attention to long established demographics, collective audience behavior and the mercurial and fickle moment-to-moment signals, we step away from conjectures, generalisations, and assumptions, and leverage the audience itself in determining how best to interact. 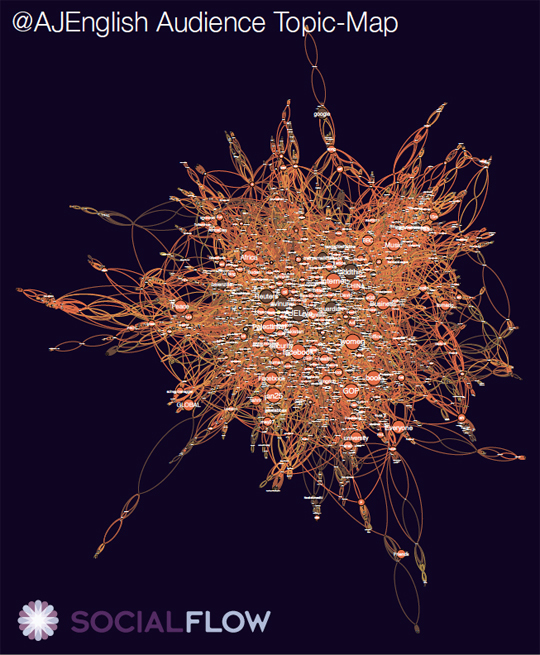 SocialFlow has also created a Twitter visualisation looking at engagement with @AJEnglish. Topics have been mapped using over the period of an hour. The larger the topic node, the more it was discussed on Twitter during that hour. Click on the visualisation to download SocialFlow’s diagram as a PDF and explore it. This entry was posted in Social media and blogging and tagged Al Jazeera English, BBC News, CNN, Economist, Fox News, New York Times, SocialFlow, Twitter on August 5, 2011 by Sarah Marshall. Writing on his BuzzMachine blog, Jeff Jarvis has called for US cable networks to start carrying Al Jazeera’s English-language network. Qatar-based broadcaster Al Jazeera has been covering the civilian unrest in Egypt but was effectively shut down by the Egyptian government on Sunday, according to reports. In the following days Al Jazeera journalists have been reportedly arrested and detained in the country. Jarvis acknowledges that Al Jazeera English is available to stream online but tells cable companies that this just isn’t enough. Yes, we can watch AJE on the internet. But as much of an internet triumphalist as I am, internet streaming is not going to have the same impact–political and education impact–that putting AJE on the cable dial would have. I can watch AJE in the Zurich hotel room where I am now; I want to be able to watch it on my couch at home. Full post on BuzzMachine at this link. The New York Times’ Media Decoder blog has also picked up on the difficulty of accessing Al Jazeera English from within the US. Media Reporter Brian Stelter talks about the issue in an NYT video. As the uprising in Egypt nears its second week, a lot of people are calling this Al Jazeera’s moment. The Qatar-based broadcaster has been showing us pictures that most US broadcasters haven’t been able to get … Al Jazeera also has an English-language channel, but a lot of people don’t know it because it’s very hard to access in the United States … Most of us can’t watch it in the US unless we watch on our computers. This entry was posted in Broadcasting, Editors' pick, Politics, Press freedom and ethics and tagged aje, Al Jazeera, Al Jazeera English, Egypt, Jeff Jarvis, media decoder on February 1, 2011 by Joel Gunter. A telling screen grab is doing the rounds – showing the discrepancy between CNN’s news coverage and Al Jazeera English’s. It shows the two channel’s front online pages, captured on the day Wikileaks released its video showing previously unreleased footage of a US army attack in Iraq. It looks like the two channels have quite different priorities. CNN goes for Tiger Woods and the iPad, while Al Jazeera puts the Wikileaks story top of its page. This entry was posted in Broadcasting, Editors' pick, Journalism and tagged Al Jazeera English, CNN on April 7, 2010 by Judith Townend. “Al Jazeera English will begin its foray into the American market on July 1 after signing its first major US distribution deal with a cable TV company in the Washington DC area,” Arabian Business exclusively reports. This entry was posted in Broadcasting, Editors' pick and tagged Al Jazeera, Al Jazeera English, arabian business, Cable TV, Director General, major US distribution deal, major US TV deal, United States, wadah khanfar, Washington DC on June 25, 2009 by Judith Townend. Al Jazeera’s Richard Gizbert co-hosted this week’s Digital News and Affairs 2009 conference, leading sessions, asking questions and throwing in a bit of his own perspective. Journalism.co.uk managed to catch him for a quick chat. Gizbert presents a weekly show called ‘The Listening Post,’ which looks at how the news is covered by the world’s media. The programme looks at the impact of blogs, online video and podcasts, as well as media in traditional formats. How did that come about? In the 18 months between when Gizbert pitched the programme to Al Jazeera, and when the Channel launched in November 2006, all the online video sites really started taking off, he explains. It was a bit of a no-brainer, then, to use video and digital content in its programme: “let’s adapt to something where we don’t need people, and it doesn’t cost us any money – even I can figure that one out,” Gizbert jokes. “In addition to that, the new media stuff keeps coming.” Gizbert has a ‘fairly young team on show’ and they respond to new material and ‘take it as it comes’. However, ‘we’re not really all that charged up with technology for technology’s sake,’ he adds. Media is often too bogged-down by technological conventions, he says, citing as an example TV reporters’ obsession with reporting live from scenes where it makes no difference whether they’re there or not. And why the media as a subject? Media is a powerful institution but compare that with coverage media does of media,” he answers. There simply is very little media analysis of media, he explains, adding that Al Jazeera English as a channel provided him with the freedom he wanted for the show. The channel ‘allows us to tell the stories we want to tell,’ he says. Another gripe he has is with the concept of ‘media loyalty’. “I don’t want them to watch us [Al Jazeera] 24-7.” Watch other channels alongside, Gizbert says. “What I don’t get are ‘viewing habits’. When people tell him ‘I take the Guardian’ or ‘I take the Telegraph’ he says ‘yeah, why don’t you read something else?’. “Why are consumers, who are so selective and open-minded about the other things in their life, so narrow-minded when it comes to media consumption?” Gizbert says. This entry was posted in Broadcasting, Events, Journalism and tagged Al Jazeera English, coverage media, Digital News Affairs 2009, dna09, dna2009, Journalism.co.uk, little media analysis, media, media consumption, media loyalty, media stuff, online video sites, richard gizbert, The Guardian, The Listening Post, the Telegraph on March 6, 2009 by Judith Townend.